« Christmas Is Almost Here! Past weekend and so far this week, the weather has certainly not been the typical December weather. Temperatures in the upper 40s and low to mid 50s. However, think this is due to change by Thursday afternoon. 50% chance of moisture Thursday and Friday. Back to sunny, but more normal temperatures Saturday and Sunday….30s. Generation schedule has been off, on, off, on, etc. Pretty much as we has been experiencing, off very early in the a.m. then on for 4-5 hours by 7:00 a.m. with off time during the middle of the day. Back on around 5:00 p.m. for 5-6 hours and back off again. Of course, today is an exception. They did not turn it off yesterday afternoon and the projection is for generation all day today. Yesterday, Stan and Jim took out a family of four from Mississippi on their first fly fishing venture for trout. Stan had Cody, who is 13, and his father Heath. Jim had Seth, who is 10, and the mother Cindy. Cody mentioned that he knew fly fishing had a Scout Merit Badge, so we had him tie up a San Juan worm to fish, and hopefully, catch a fish on. From a young man we helped with his badge last month, we believe they have to catch a fish on a fly they tied. Anyway, hope this helps him as he did catch a fish on his fly. Everyone had a great time and caught fish. Their best pattern was the size 18 copper dun midge. Jim’s group also used a size 16 grey midge, the black zebra and the red midge. Neat family and think they will be good fly fishers some day. 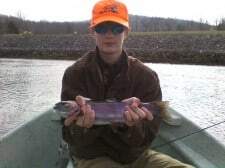 This entry was posted on Tuesday, December 21st, 2010 at 10:35 am	and is filed under Fishing Reports. You can follow any responses to this entry through the RSS 2.0 feed. You can leave a response, or trackback from your own site.